Who doesn’t love to get the grill going on a nice day? Nobody, that’s who. 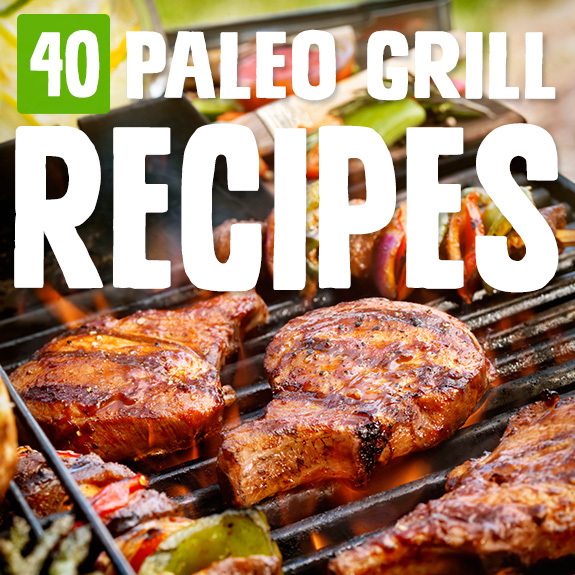 So try some of these paleo grill recipes the next time you’re feeling like you need some pyre in your life. This perfectly grilled steak is smeared with a lovely sauce of yellow onion, garlic, olive oil, and freshly chopped cilantro. Not everyone loves cilantro, so if this all sounds wonderful to you besides that flavor, you could give it a try with basil instead. 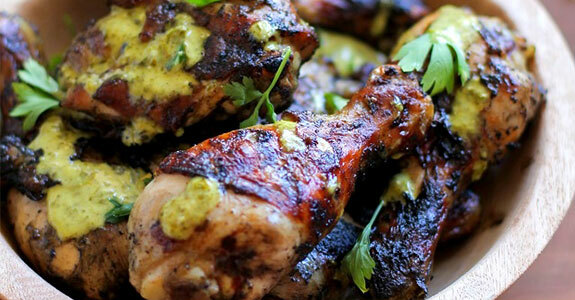 Obviously these chicken legs would traditionally be cooked in a tandoor oven (hence the name), but you can do them on the grill with an awesome seasoning mixture of coconut milk, lime, cilantro, garlic, ground ginger, cinnamon, paprika, turmeric, and other spices. We all know that sugar caramelizes when exposed to high heat, and yet it still doesn’t occur to many people to try grilling fruit. Why not? This grilled pineapple salsa is sure to convince you. Why not get a little bit unusual right off the bat in this list, and give grilled squid a try? This dish is made with red cabbage leaves, assorted bell peppers, pomegranate seeds, salt, pepper, paprika, and a lovely pomegranate dressing with apple cider vinegar and olive oil. These awesome fajitas are marinated in onion, lime juice, garlic, and olive oil for a perfectly traditional and delicious flavor, and then they’re grilled until perfect. 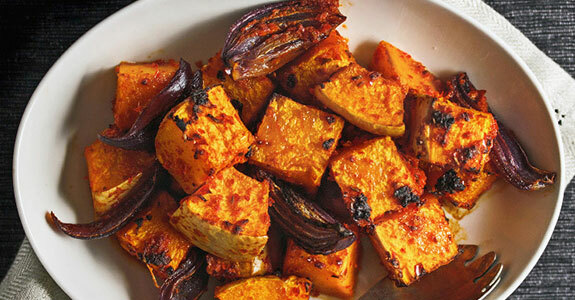 Serve them up with some charred onions and peppers. 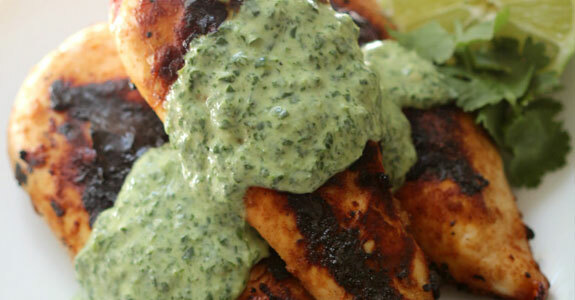 This garlic chicken is grilled with black pepper and ground fenugreek, creating an interesting blend of flavors that is perfectly complemented by the green goddess sauce, made from tahini, coconut milk, lime juice and zest, garlic, onion powder, and black pepper. This grilled broccoli dish can be made on your Panini press or other small, indoor grilling appliances. You’ll need broccoli, olive oil, garlic cloves, red chili, sea salt and black pepper, toasted sliced almonds, and thinly sliced lemon, this is a perfect take-to-work lunch. Even if you choose not to make this dish as tacos, the grilled steak recipe is awesome. To make the tacos, you’ll use skirt steak or flank steak, sea salt, black pepper, lime juice, cumin, romaine lettuce as wraps (or paleo tortillas), and your favorite toppings. 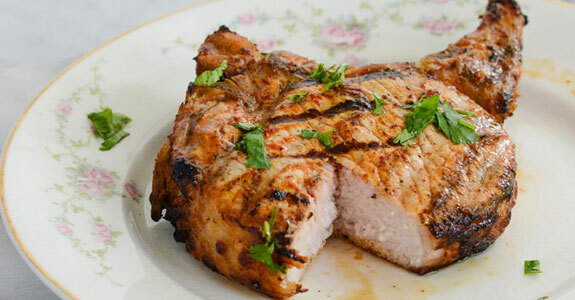 This recipe is technically called “Soy Marinated Grilled Chicken,” but you can make it paleo without a problem by swapping out the soy sauce for coconut aminos. If you’re so inclined, you could also substitute honey or maple syrup for the agave nectar. 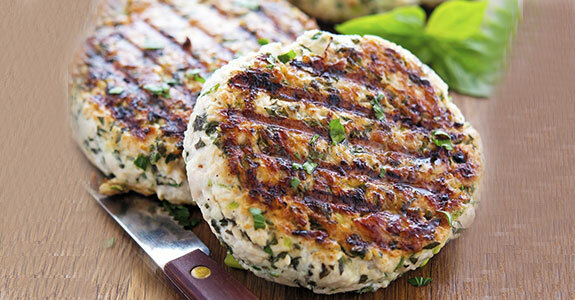 Need a good turkey burger recipe? Give this one a try, with the flavors of ground turkey, basil, scallions, parsley, anchovy, paleo mayonnaise, sea salt, and ground black pepper. Fire up the grill and chop up all your favorite toppings. When I was a kid, I couldn’t stand dressings of any kind—I think the sour or tart flavors in them were too much for my taste buds. 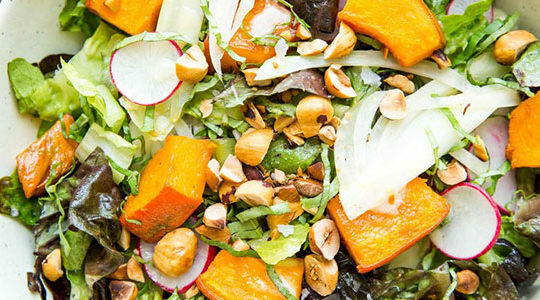 But as an adult, I think the dressing makes the salad—especially the amazing apricot mint dressing on this delicious grilled apricot salad with endive. Almost everything tastes better on a stick. So give these skewers a try, made with butter, a hot red chili pepper, garlic, chicken sausage, shrimp, salt, and pepper. I think these would make a great party food or appetizer for when you have company! This recipe is a great alternative to actual bruschetta when don’t eat grains. You’ll need salad greens, red onion slices, grilled chicken, white balsamic vinegar, olive oil, crushed garlic, salt, pepper, and shredded asiago cheese if you eat dairy (it’s totally optional). This sauce is absolute perfection when it comes to grilling, and it doesn’t even require any cooking for itself. You’ll need fresh red chili peppers, ground cumin, ground coriander, caraway, sea salt, fresh garlic, fresh coriander, lemon juice, and olive oil. Love that lemongrass pork from your favorite restaurant? Well, now you can save money and eat healthier by making it on your own at home! 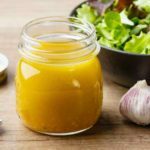 This recipe uses garlic, shallots, lemongrass, coconut aminos (to replace the soy sauce), honey, fish sauce, and fresh lime juice. 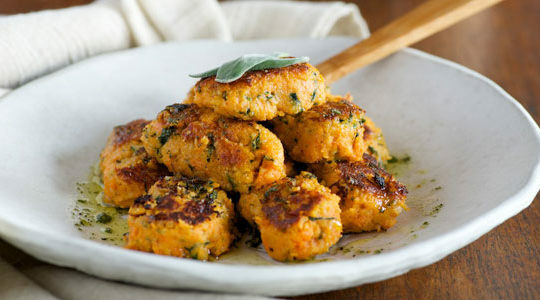 I love that this recipe has “quick” in the name, because don’t we all need a quick weeknight dinner every now and then? This one only takes a few minutes if you prep the chicken the day before my mixing up the marinade so it soaks up all those yummy flavors. This dinner uses olive oil, white wine, garlic, oregano, lemon, peppercorns, and Dijon mustard, and it’s absolutely perfect for date night. Make up this marinated lamb leg for yourself and your love, and give yourself a much-needed relaxing dinner. BBQ Sauce is pretty much my husband’s favorite way to eat chicken no matter how it’s prepared. 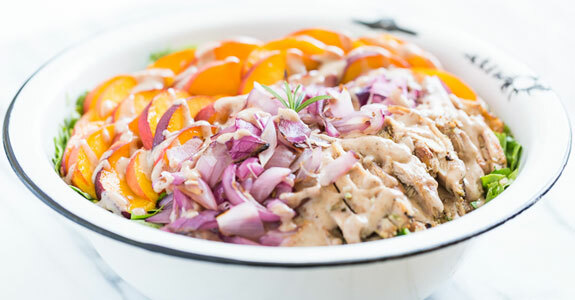 This recipe is one of the ones he likes best, with chicken breast, paleo-friendly BBQ sauce, purple/red onion, and chopped cilantro (or another herb, like basil). If you’re going to be grilling, you really need to make up a batch of this paleo BBQ sauce. You’ll want to get your hands on some paleo-friendly ketchup, honey, molasses, apple cider vinegar, smoked paprika, cayenne, peaches, raspberries, and a few other tasty ingredients. This smoked chicken dish is so simple to make. You’ll just need chicken thighs, a bit of course sea salt, and wood chips of your choosing. You can really play with the flavors of the smoked chicken depending on what type of woods chips you use. This dinner is so simple to make, you won’t even believe it. A simple grilled skirt steak is matched with heirloom tomatoes, beautifully cooked eggplants, red wine vinegar, chopped fresh herbs, red onion, and olive oil. If you eat cheese you can include the feta, or leave it out. Chicken is probably my favorite type of grilled meat, and this recipe for grilled chicken with cloves, paprika, allspice, nutmeg, cardamom, olive oil, and lemon with a dill sauce will send you right off on a Mediterranean vacation. I’m a huge kabob fan, and I maintain that skewers can be a great way to convince kids to eat nutritious meals they wouldn’t otherwise touch. Try this recipe with chicken breast or thigh meat, orange juice, coconut aminos (to replace the tamari), sesame seeds, garlic, and more. 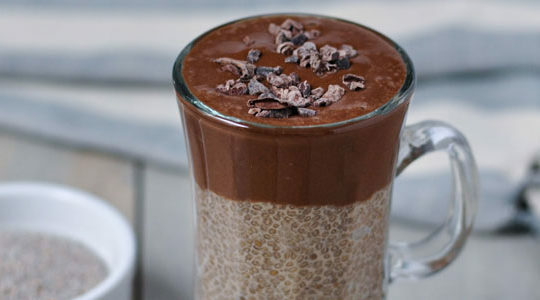 Speaking of kids eating healthy food—this recipe is a winner. Hey, it’s even a winner for grown-ups too, because who doesn’t like a good rainbow lunch or summer dinner? Make this one with various fruits and vegetables and a pretty pink raspberry dressing. Figs are one of my new favorite fruits, and anything paired with balsamic vinegar feels extra fancy and elegant. Try these skewers made with steak, figs, white onion, honey, balsamic vinegar, olive oil, garlic, thyme, red onion, and salt and pepper to taste. I’m not a big salad eater (gasp!) but I do love salads that balance out their “leafiness” with grilled chicken, fruits, and other ingredients. This one if one of my favorites, with garlic, grilled chicken, rosemary, peaches, and a delicious pecan vinaigrette. This recipe is foolproof if you follow it carefully. Not the best at grilling? No problem. 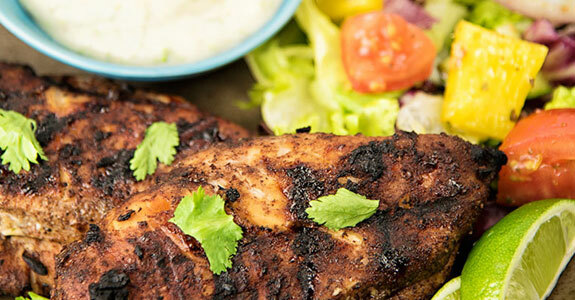 The secret to this grilled chicken is in the brine recipe and in the special method that allows the marinade to penetrate the chicken and make it all juicy and tender and delicious. 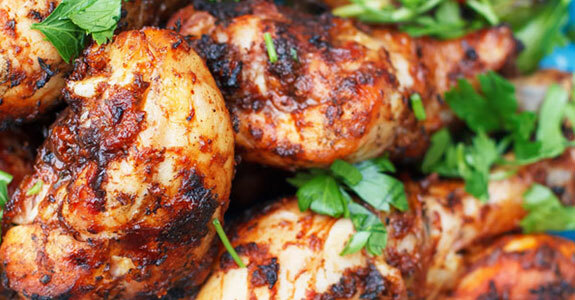 It appears we’re on a kabob kick. Is that a problem for anyone? I didn’t think it. 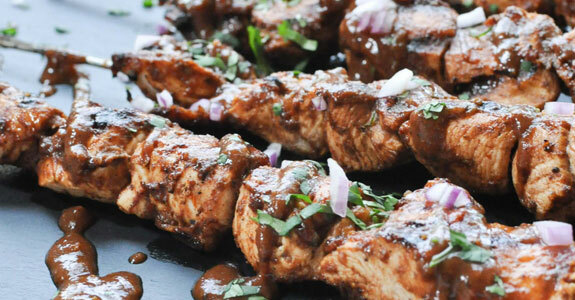 This recipe uses a marinade with balsamic vinegar, Worcestershire sauce, coconut aminos (to replace the soy sauce), horseradish, coconut oil, oregano, dried mustard, and more. These pork chops are Whole30 friendly and get most of their flavors from chili in adobe sauce, dried Italian spice mix, garlic cloves, lime juice, and fresh cilantro. These would be perfectly with a side of grilled peppers, or anything, really! Pineapple is one of my favorite things to add to kabobs. It’s perfectly sweet and tangy, and it grills so well! Make these kabobs Thai-style with coconut mill, curry paste, lime juice, cilantro, and deliciously juicy chunks of fresh pineapple. These skewers are rainbow colored and made with a delicious orange marinated. You’ll need oranges, olive oil, garlic, red bell pepper, eggplant, zucchini, red onion, cherry tomatoes, and pineapple—but use whatever you have on hand if you need to substitute. This salsa recipe is made with leeks. Never had a leek salsa? I hope you’re ready to give it a try. You’ll need leeks (obviously), green bell peppers, tomatoes, chopped cilantro or basil, minced garlic, chopped jalapeno, lime juice, black pepper, and sea salt. This Moroccan-inspired meal is anything but short on flavor. What do you expect out of a recipe that boasts 15 cloves of garlic, sumac, ground nutmeg, red onion, and Harissa paste? Lots of flavor, heat, spice, and absolutely deliciousness is what you should expect. Still looking for a BBQ sauce you can make for your family? This one doesn’t have any sweetener added, and gets its sweetness from apple butter. You won’t need paleo ketchup for this one, either. 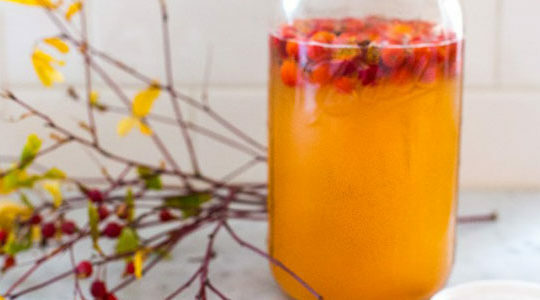 Make it with apple cider vinegar, Dijon mustard, smoked paprika, and more. This yummy grilled salad is made with white vinegar, quail’s eggs (or hen’s eggs), cherry tomatoes, olive oil, green onions, lemon juice, tahini, garlic, and Dijon mustard. The scallion pesto uses parmesan with nutritional yeast as a vegan and paleo substitute. These watermelon appetizers are little grilled slices of heaven topped with hazelnuts and a delicious dill drizzle. 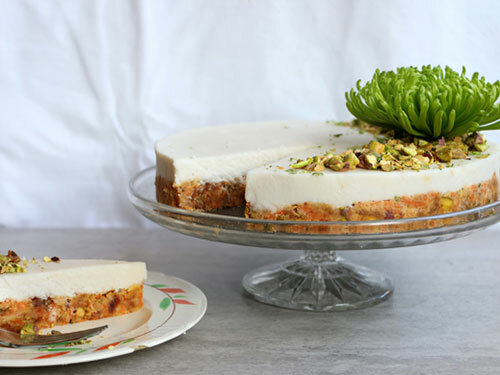 The recipe calls for feta and parmesan, but you can just use more crushed nuts if you don’t eat any dairy. Just look at this chicken. Look at it! If that golden brown skin, grilled blackening, and lovely sauce don’t make your mouth water, then I don’t know what will. 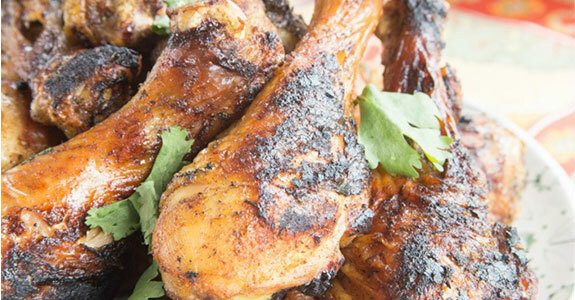 Give it a try with bone-in chicken thighs and drumsticks, garlic, fresh parsley, fresh cilantro, olive oil, lime juice, sea salt, and white onion. This recipe is perfect for spring time when you’ve got plenty of fennel and not a whole lot of very much else. Make it with olive oil, parsley, garlic, salt, pepper, and freshly grated lemon zest. The parmesan cheese for serving is totally optional. Feel like firing up the grill, but looking for something different to put on it? 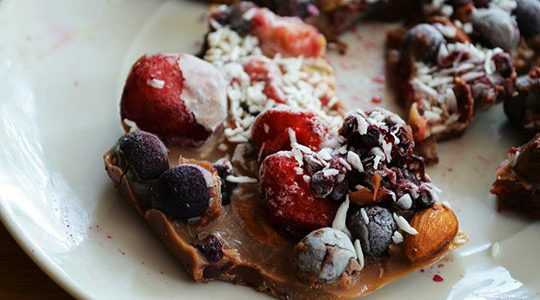 Try this dessert or indulgent breakfast recipe for a grilled cherry crisp with cherries, honey, dark chocolate, coconut and almond flours, cinnamon, coconut sugar, a pinch of salt, coconut oil, and raw almonds.